Our problem holding the ball in the second half seemed to have much to do with the O’Neill being overworked defensively (he had a stellar game, I thought). Perhaps this was because it is not yet clear that Retre can manage Brillante’s defensive load. Also, at RM, Caceres offered little defensive cover (apart from fouling) and little outlet in transition to attack. So, O’Neill, in Brillante’s absence, seemed to sit deeper covering for attacks coming down our right. With Grant also pinned back defensively and Caceres effectively unavailable for transition, Zullo was really our only option for direct transition. Given that KF kicked the legs from under Ninko all match, that avenue was also less effective than normal. This left our attackers abandoned, even if Alf and Brosque did a power of chasing and tackling. We really need to fix that RM hole. Ivanevic looks lively when attacking but offers no defensive strength or grit, at this stage. Maybe if he fills out in the next year or two. However, the KF goalscorer, when shooting, took advantage of Ivanevic’s very poor positioning. I am not confident Caceres or even De Jong (current version) would have done better there, but an Adrian, Holosko or Kisel would have. What about Grant to RM and Tratt to take RB? That would fix both attack and defence on the right side. Or Reza to RM? I had to read that a few times before I understood your ideas, pietro. Grant probably played a game or two at right mid when he was younger. The right mid in our formation plays a bit like an AM though, which might be too much for Grant to handle. I don’t think he’s quite good enough on the ball for that. He’s played #10 before, which I’m sure was a game in the ROT era and it was … not good! Like I said last night, I’m not sure how much better we can get than playing Caceres at RM with our injury woes. Apparently Reza CAN play a wide right role (source: transfermarkt, so take of that what you will) but I can’t say I’ve ever seen it happen or how good he is at it. Grant playing 10 scored a beauty though. 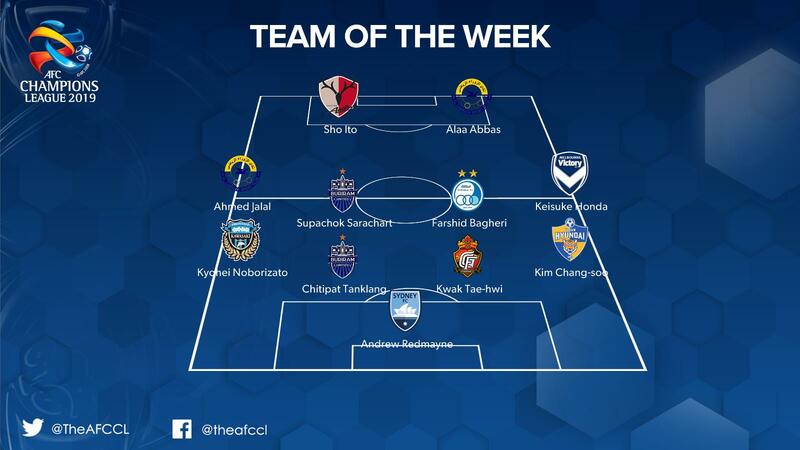 🙌 This is your #ACL2019 Matchday 2️⃣ Team of the Week! Well deserved, too. He made some good saves and kept the score respectable for us. Only losing 1-0 keeps us in the hunt if we can win one of our next two games. Footage of the cove singing at the game.